Begun in 1904 at a time of seemingly endless prosperity and growth, its creation was encouraged by the newly-elected Liberal government of Sir Wilfred Laurier at the urging of Sir Charles Rivers-Wilson, Chairman of the Grand Trunk Railway. It was an expansion into the west where previously the Canadian Pacific Railway reined along with Mackenzie and Mann's Canadian Northern. Originally the Grand Trunk had only wanted to build west from North Bay. 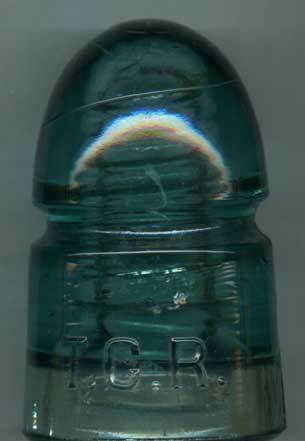 This was a threat to the CPR, one that Charles Melville Hays, General Manager of the GTR hoped would make the CPR offer running rights through Northern Ontario. The CPR was a better poker player and didn't fall for the bluff. Later, it was changed to start at Quebec City at the urging of Laurier. The government was to be a major partner in the works. It was to be a 4,000 mile direct route between the Atlantic and Pacific oceans. 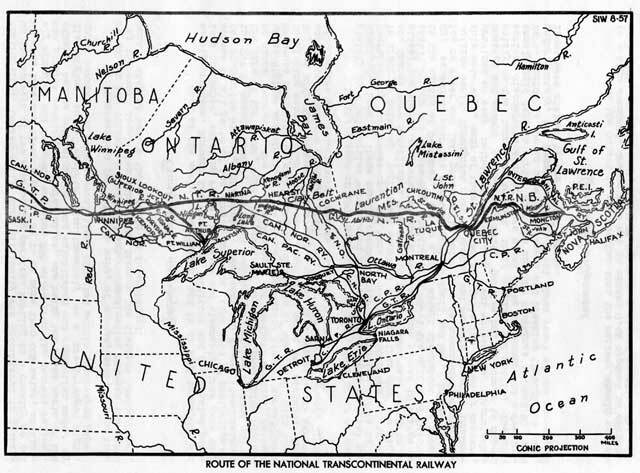 National Transcontinental was to build west from Moncton, New Brunswick across northern Quebec and Ontario 1, 844 miles to Winnipeg, Manitoba. The second portion was the Grand Trunk Pacific, wholly owned by the Grand Trunk, between Winnipeg and Prince Rupert, British Columbia, 1,944 miles across the northern prairies and through the Yellowhead Pass, the lowest crossing of the mountains in North America, requiring a grade of barely over a half of one percent. This was the pass turned down by the CPR which struggled up an incredible 4.5% through Rogers Pass. A further existing 185 miles of the Intercolonial Railway between Halifax, Nova Scotia and Moncton, was also to be part of the NTR for a grand total of 3,974 miles. Construction was to be of the best practices and substantial construction methods and materials with very low grades, (not to exceed 0.4% eastbound and 0.6% westbound), easy curves (a gentle 6 degrees). Steel bridges rated for 180 ton engines and 80 pound 33 foot rail was used. This was in contrast to the CPR and most other railways that often were built as quickly as possible and with minimal facilities, with improvements made at a later time. The actual construction saw a few exceptions that resulted in helper grades of 1.1% in places. One such grade 146 miles west of Moncton of about 12 miles saved 17.2 miles in distance and $2 million in construction. Another of 10 miles saved 18.8 miles and a half million in construction. Construction was difficult and carried on throughout the perishing winters as well. 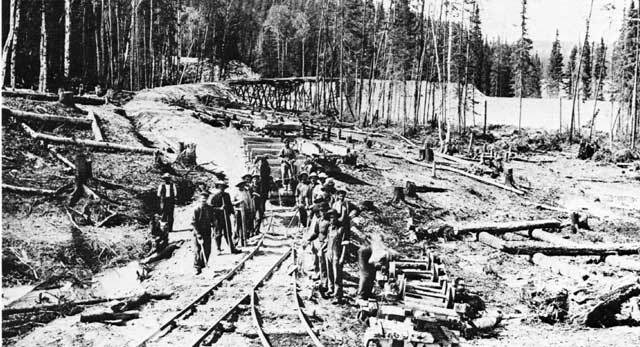 Bridges, temporary wooden trestles, rock blasting, major fills including muskeg sink holes all added to the construction problems. 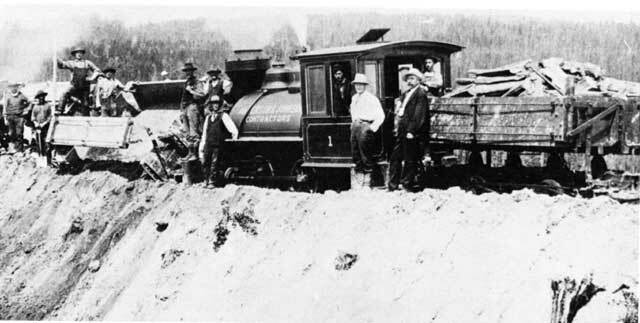 Contractors used various construction trains and dinky engines including an 18 mile narrow gauge railway built in 1908 around the rapids on the Nipigon River where supplies were landed. 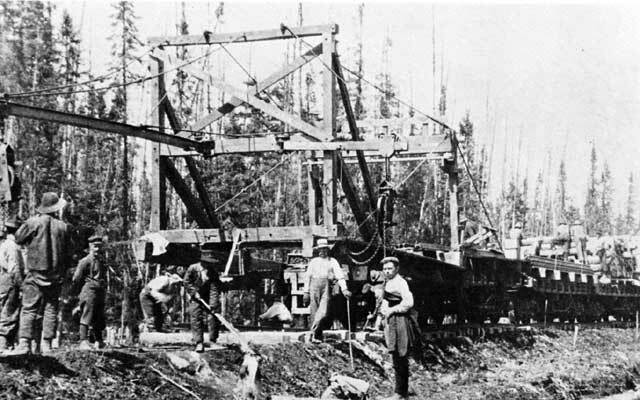 The last spike was driven on November 17, 1913 at Grant, a small place west of Cochrane, Ontario. Construction methods were crude in the early 20th. Century. Through the wilderness of the north. 0-4-0T #1 of Anderson and Johnson Contractors. Another contractor was the well known J.D.Mc.Arthur. 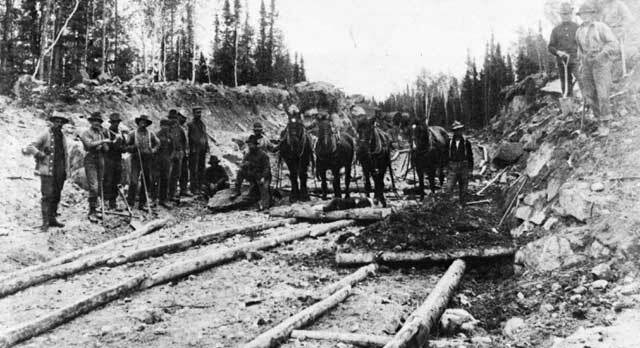 Hicks rail layer at work. There were the usual deaths common to early construction especially in difficult locations; however the worst were at the infamous Quebec Bridge, where on August 29, 1907 its collapse killed seventy-four workers. The government took over the bridge and built a newer and much bigger one. It too failed during construction, this time only two lives were lost on September 11, 1916. 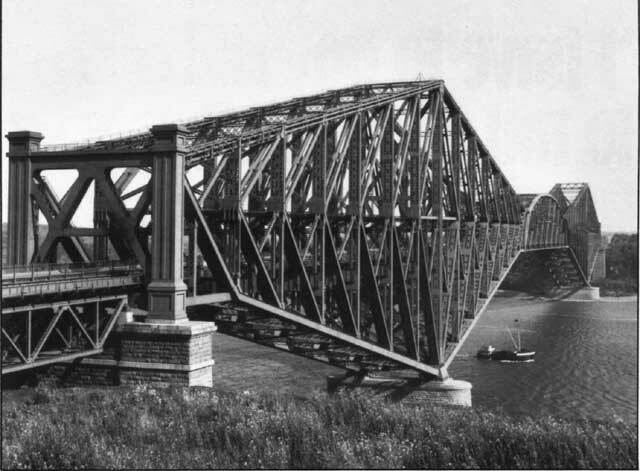 A new replacement span was installed in September 1917 and finally the National Transcontinental was completed the following month. Before the Quebec bridge was built the car ferry Leonard operated between Quebec City and Levis. All of this resulted in a very expensive railway, nearly $170 million, or nearly double the original estimate. Questionable contracts were part of it. 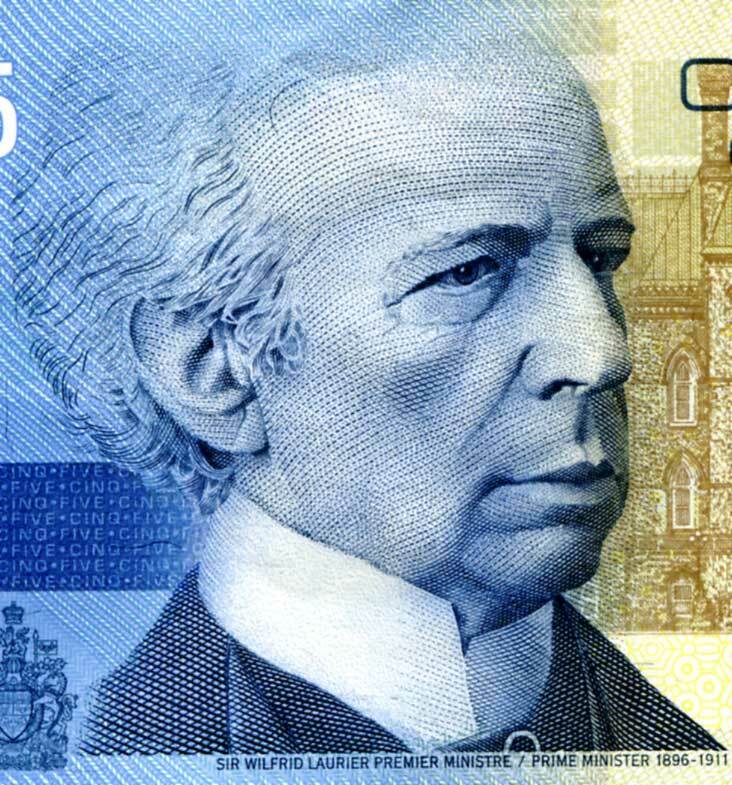 More than $40 million was overspent east of the St.Lawrence River alone, according to a Commission set up by the new Conservative government of Robert L. Borden that defeated the Liberals in 1911 in part because of the NTR. and even these differed from the official name, National Transcontinental Railway. Following completion of the NTR the GTP refused to honour their pledge to take it over due to the vastly increased construction costs which affected their rent which had been set at 3% per annum of the total cost. They also charged that following the 1911 change of government, construction standards had not been upheld. It was not the only reason though; the financial troubles of the GTP and GTR's own situation were of even more importance. The government now was forced to retain ownership of the NTR and in June 1915 created the Canadian Government Railways to operate it and the Intercolonial. It was soon to take on even more broken railways as the Canadian Northern and Grand Trunk followed resulting in the creation of the Canadian National Railways. The government of Canada was to remain in the railway business for over a century until the CNR was privatized in 1995. The former NTR across northern Quebec and Ontario never achieved the greatness its proponents had envisioned for it. Eventually, it was broken in 1993 with the abandonment of 122 miles of mainline east from Nakina, in northern Ontario. The next 151 miles beyond Calstock to Cochrane was taken over by the Ontario Northland and continues in use. East of Cochrane another 82 miles to La Sarre, Quebec was abandoned effective April 1, 1997.